Photo taken in the Red Sea. 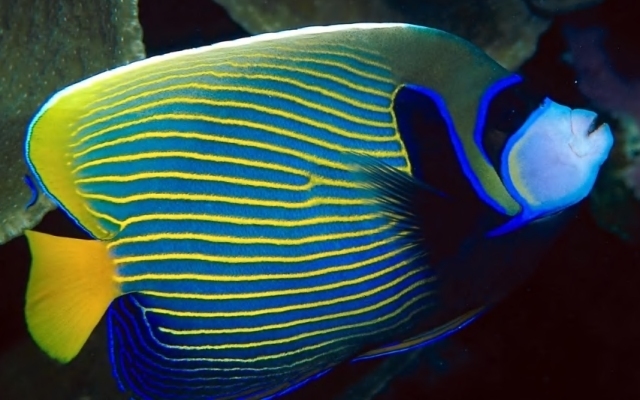 Emperor Angelfish have deep, flat, bodies and small mouths. They are striking to look at, being large (40 cm) and colourful. The flattened shape of angelfish enable them to wind their way amongst the corals; it also enables them to retain their stability when manoeuvring at low speed to pick up items of food, in the same way that a keel of a sailing boat helps with its steering and prevents it from turning over. You see the Emperor Angelfish in warm seas around the world, including the Red Sea, East Africa, Hawaii, Japan and Australia. The young angelfish looks totally different to the adult, having concentric white rings on a dark blue background. You will find the juveniles under ledges or in holes of shallow reef flats. Adults go deeper, from 3 - 70 metres. Adult males typically defend a large territory containing 2 females. However, you will ususally see the fish in pairs. The fish are protogynous. This means that they are born as females and develop into males later.